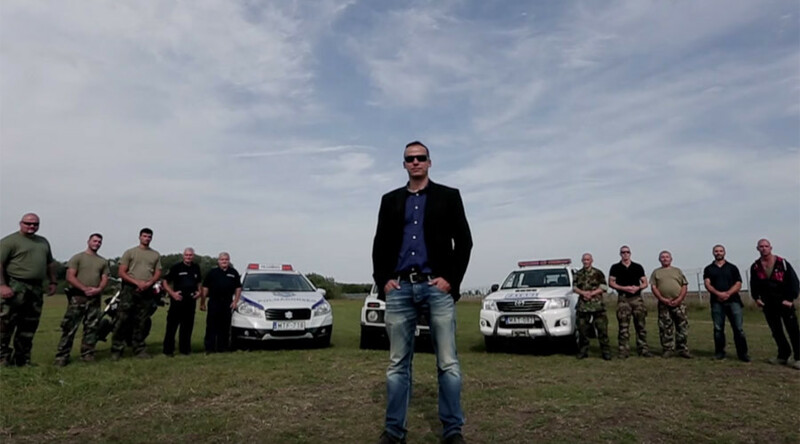 A dramatic anti-refugee video featuring a right-wing mayor from a small Hungarian town next to the Serbian border has been released just as the government attempts to seal its borders in order to stem the flow of asylum seekers crossing into the country illegally. Laszlo Toroczkai is mayor of the town of Asotthalom, which has wound up right in the center of the ongoing refugee crisis, and leader of the Sixty-Four Countries Youth Movement, a nationalist group that seeks to reclaim lands that historically belonged to Hungary. In the two-minute-long action-packed footage Toroczakai, once expelled from a far-right party for being too radical, filmed alongside a dozen other tough guys, make it extremely clear that people running from war and hunger are not welcomed in their area. “From today, 15 September, in Hungary, crossing the border illegally is a crime,” he starts in a grave voice. “From now on, the borders of Hungary are protected by a fence that is continuously being built, by thousands of policemen and by the Hungarian army,” he adds. After a staged chase with motorcycles, helicopters and even horse patrol set to, of course, rather aggressive music – scenes one would expect to see in a James Bond movie – Toroczkai assumes the role of an experienced tour guide, pointing out that that the route from Serbia to Germany is shorter though Serbia than though Hungary, thanks to Google Maps. He however forgets one thing – the way though Serbia is a much more mountainous. The last shots don’t give a single chance to those who haven’t given up hope of visiting the hospitable place yet. After the whole gang is shown standing in the middle of a picturesque green field, all geared up and ready to ‘protect’ their homeland, Toroczkai voices the final warning.